One of the things I’d like to try soon is the JT65 digital mode. Like WSPR, it works even with very weak signals, but unlike WSPR, it allows two-way communication rather than beaconing. When trying out WSTJ, the program that runs JT65, I discovered that it switches the transceiver from receive to transmit modes using the DTR or RTS signals on a serial port, not using CAT commands (multi-byte commands through the serial port). JT65-HF, another program that supports JT65, does the same. I therefore decided to add receive-transmit switching (PTT) to the serial/sound-card interface I hacked together for the FT-857D. I checked the DTR and RTS signals on the FT232R breakout board and discovered that both were active high, meaning that they are high most of the time, but when a program like WSPR or WSJT wants to transmit, it activates DTR or RTS, which brings them low, to near 0V. The PTT connection in the transceiver should be driven by an open-collector transistor (e.g., an NPN transistor with the collector connected to the PTT line and emitter to ground), and it’s easier to drive the transistor with an active-high logic signal. Fortunately, the maker of the FT232R, FTDI, makes available a utility called MProg that can configure these signals to active-high. I ran it, configured the chip, and the signals indeed got inverted. I added the NPN transistor to the strip board, it’s base connected to RTS via a 2.2kΩ transistor (PN2222). Now these programs can switch the transceiver to transmit using the RTS signal. I didn’t have time to try JT65 yet (there’s a learning curve there), but I’m now ready, hardware wise. I bought a new Yaesu FT-857D transceiver and needed a computer interface for it. Yesterday I put together a quick interface, which you can see in the picture. The serial interface to the transceiver (which is called a CAT interface) uses an FT232R USB-to-serial bridge chip on a breakout board (made by sparkfun). The audio connections are simply wired directly: the audio out and audio in lines of the transceiver are connected to two 3.5mm stereo jacks (but the audio is mono, not stereo). The jacks are salvaged ones from the motherboard of an old Apple eMac. The stereo jacks have pins that won’t fit nicely on a prototyping board. They had a metal cover, so eventually I decided to solder their metal cans to a piece of scrap PCB. This held them in place, and I soldered the audio in/out wires to their pins, which now point to the sky. The serial breakout board can be wired for either 3.3V or 5V logic. It was originally wired for 3.3V; I removed the solder bridge that configures it to 3.3V and soldered a wire between the VCCIO and VCC pins to configure it to 5V, which is the logic level of the FT-857D. I then secured it to the scrap PCB with screws and spacers. Finding the 6-pin mini-DIN connector for the audio connection to the transceiver was easy; I just used the cable from an old PS/2 keyboard. The 8-pin mini-DIN connector for the serial CAT connection was harder to find. I ended up buying an antique serial cable made for an Apple IIc, which had the 8-pin mini-DIN on one side and a full size 5-pin DIN connector on the other. I cut out the 5-pin DIN connector and thought I was all set. It turned out that in both cables not all the pins of the mini-DIN connectors were connected. But luckily, all the connections I needed were wired. This includes the serial in and out lines, the audio in and out lines, and also the PTT line, which I have not yet used but I might. The 13.8V supply from the transceiver is also available, in case I want to power an accessory. That’s about it. I soldered the wires coming from the transceiver to a piece of strip board that I soldered to the base PCB and connected the audio lines to the stereo jacks. I left the serial connections open, in case I made some mistake in figuring out which wire is which (13.8V applied to the FT232R would have killed it). I connected the transceiver and verified the voltages on coming out on the wires. The 13.8V was where it should have been, and the serial lines were pulled up to 5V. I connected the remaining wires, connected the laptop to the USB-to-serial bridge, and fired Ham-Radio Deluxe (HRD), the free and slick transceiver control program that I wanted to use. It worked! I then fired up DM780, the digital-modes program that comes with HRD and was pleased to see that the audio-in line indeed carried the signals I expected. DM780 decoded many PSK31 signals. The audio out line also worked fine. It was pretty late in the evening, so I tried to contact stations using PSK31 on 7MHz, using the coax loop. The loop tunes fine on 7MHz, but is pretty inefficient there. One station heard me, but not well enough to make a contact. I switched to WSPR, received a few stations, and then tried to transmit. A station in Ukraine heard me immediately. This was the first time, I think, that this antenna transmitted on 7MHz. 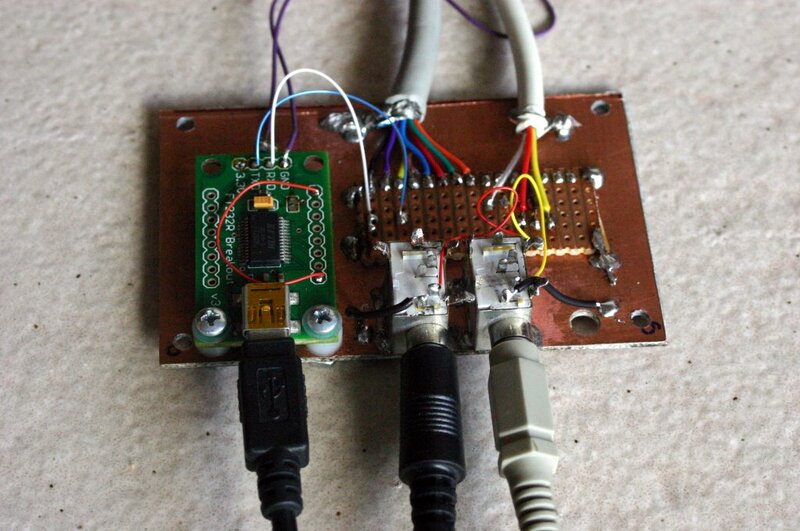 This interface is not something that you would want to build if you had to buy the parts; the breakout board costs almost as much as a ready-made USB-to-serial cable with a connector specifically made for this transceiver. 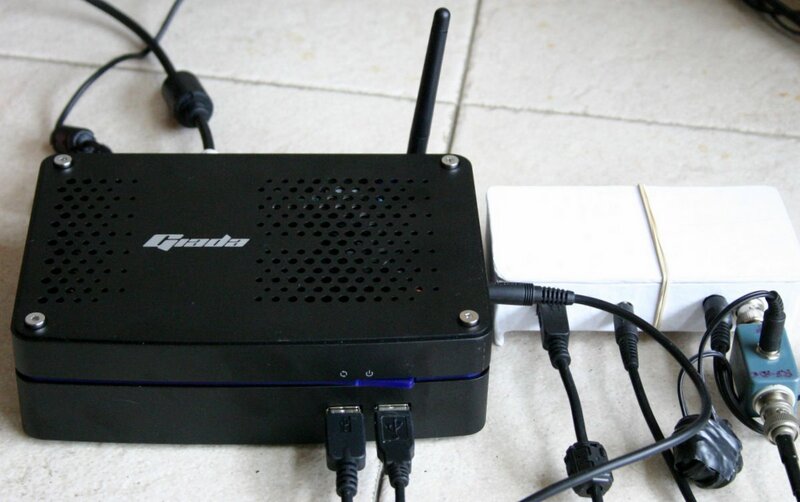 But I had all the parts at hand, and I wanted to connect the laptop to the transceiver as quickly as possible. A final note: most of the sound-card interface designs I found on the web for both this transceiver and other ones used 1:1 audio isolation transformers. Many of the same designs make the serial connection without isolation, meaning that the radio ground is connected to the computer ground. Given that the grounds are already connected, I didn’t see any reason to use isolation on the audio paths, so I just wired the transceiver audio directly to the sound card. I also verified that my laptop ground is floating. That is, even when it is connected to the AC mains through its power supply, the DC connections of the power supply are isolated from the AC ground connector. An isolated interface is safer, but it would also require isolating the serial connection using opto isolators or RF isolators. Without the serial isolators, I think that the audio isolation is not useful. A few weeks ago I helped Nir Israeli diagnose a problem with his Softrock RXTX 6.2 transceiver. The transceiver is crystal controlled and covers portions of the 10MHz and 7MHz bands. While looking at the schematics I realized that Tony Park, the designer of the kit, used a 40.5MHz crystal to cover the 10MHz band. I had a partially built Softrock 6.2 receiver, and I decided to convert it to 10MHz using a 40.5MHz crystal that I ordered from GenesisRadio (along with 9 other crystals; they offer good frequency selection and low prices). The receiver is the “upgraded” version, which means it has lower noise and higher gain opamps than 6.2 receivers for lower frequencies. I only partially built it because I tried to use it with an Si570 synthesizer and a switched bandpass filter; this setup did not work so well. I removed the components I added to the board for the experiment, wound the toroids for 10MHz, installed them, installed the oscillator circuit and the new crystal, and tried it out. 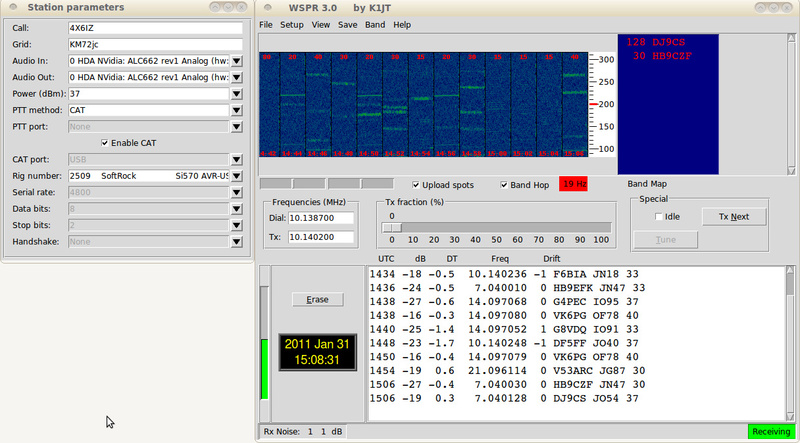 It works very well with WSPR (it again took me a while to figure out the fiq setting, but I eventually got it right). I can now cover most of the 10MHz band with this unit. It joins the 7MHz receiver I used previously for WSPR, the 14MHz receiver (which unfortunately does not cover the WSPR sub-band), and the Si570-driven Ensemble II RX receiver. The use of the 40.5MHz crystal should make the receiver more sensitive than the crystal that Tony Park ships with the kit, because the original 13.5MHz crystal relies on subharmonic sampling (it does not sample the radio signal at every cycle, but only once every 3 cycles). I did not compare them directly, however. I am not sure why Tony used the 40.5MHz crystals in transceivers but not in receivers.